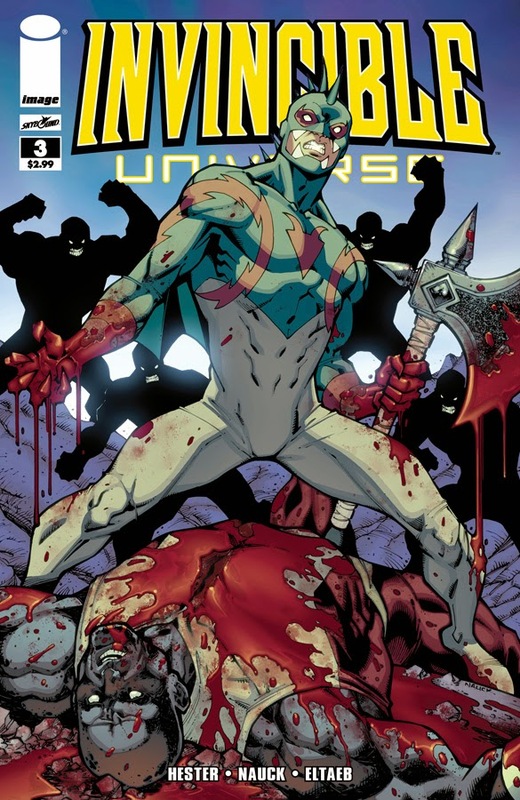 The Fellowship was fortunate enough to obtain a copy of INVINCIBLE UNIVERSE #3 from Image Comics. The story is by Phil Hester, with art by Todd Nauck, colors by Gabe Eltaeb, and lettering by Rus Wooton. Francisco (A.K.A. El Chupacabra) is trying to deal with the death of his teammate Milos (A.K.A. Cast Iron). Milos sacrificed himself in order to save Francisco. He decides to go to Cast Iron’s home town and ask for forgiveness from the young man’s family. Upon arriving in Sikole Serbia, Francisco finds out the truth about Milos’s family, but will he survive the experience? I’ve enjoyed Todd Nauck’s style since the days of the original Young Justice series and his own book Wildguard. His art is just as clean and expressive as it has ever been. Nauck does super hero art right. The story by Phil Hester is a little generic, but that’s not to say this wasn’t an enjoyable story. I’ve enjoyed this series so far. It reminds me of classic superhero teams of the past. It’s worth checking out. INVINCIBLE UNIVERSE #3 is stores now or available for ordering at www.Imagecomics.com.